Candies Pokie Review - Play Today! Candies speaks directly to the taste buds of the player and soon grabs attention with the sweetest wins. B3W created this pokie to increase your energy with the best looking sweeties around and players can start tasting the flavours on 3 reels that offers a single peppermint tasting payline. The game impresses with features that adds even more flavour-able wins with multipliers, wilds, holds and re-spins. Choose your favourite sweet or just enjoy them all as the jackpot bonus offers a sugary win of 1,000 coins. 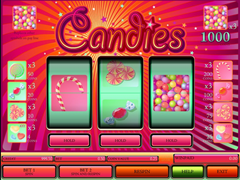 Candies is a classic pokie, which means low wagers with massive rewards are available in the game. The coin value of the game is fixed and cannot be changed from $0.25. The game will let you bet up to 2 coins per spin and activate the hold feature. The game will offer a maximum bet of $0.50. Candies bursts colourfully onto your screen with rays of fun that offers orange, pink and purple lines decorated with silver and pink stars. The screen offers the payouts in fun filled cubes to inform players of the best winning selections. The hold buttons are easy accessible, placed below each fast spinning reel and the functional keys are offered on bright informative keys at the bottom of the screen. Colourful graphics with classical sound is coupled with the sweetest symbols to offer this colourful pokie in a fun way. The symbols include white and pink striped candy canes, a mixture of bright coloured jelly beans, sweetheart heart shaped treats in yellow blue and dark pink, red candy wrapped in clear see-through wrappers, large lollipops in circles of soft pink and neon coloured syrup candy, orange sweet wrapped in light pink transparent wrapper and bon-bons in a soft orange colour with bright pink striped strawberry flavour. The symbols with the different coloured candies will be the wilds for all the other symbols. This means it will have the ability to represent other symbols on the reels and reward you with the payouts for those combinations. The symbol does not multiply your combinations. Get all 3 of them on a line to receive 1,000 coins. The hold features the game offers will only be played when 2 coins are bet per spin. This will let you hold some of the reels while the other re-spin for a possible combination. The re-spin will cost no additional fees. All resistance crumbles when the sweetest wins calls you to this pokie covered in the finest sugary treats. The game offers smooth play that brings the most tasteful wins on peppermint flavoured reels. The features increases winning opportunities considerably with wealthy payouts.